Grandparents...Please join us for a special afternoon with your kindergarten - 6th grade grandchild(ren). Your afternoon will start with chapel at 1:00 p.m.at Traders Point Christian Academy followed by an open house at 2:00 p.m. 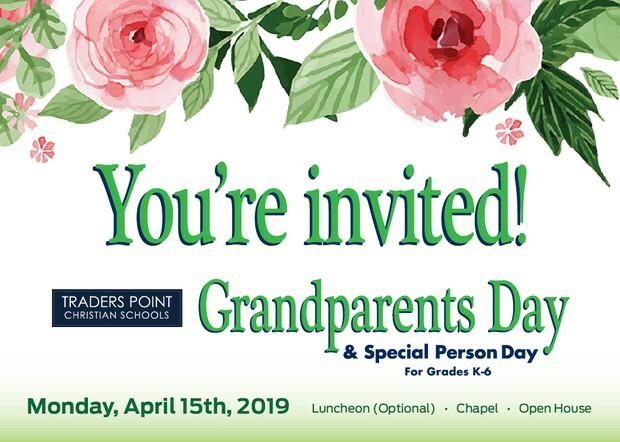 Parents...Please make sure your student's grandparents have this special day on their calendar. * Please note, if a student does not have a grandparent who is able to attend, please invite another special person (other family member, special friend, parent) to be a guest for this event.